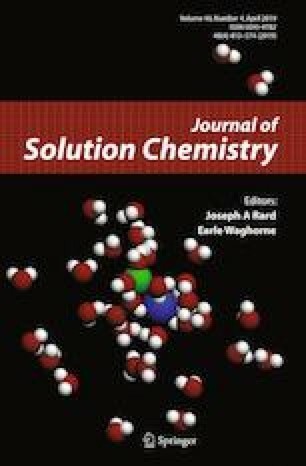 The equilibrium solubilities of malonic acid in 2-propanol and ethyl acetate mono solvents, as well as in (2-propanol + ethyl acetate) binary solvent mixtures, were determined from 278.15 to 313.15 K. The obtained solubility data were correlated using thermodynamic models including the modified Apelblat equation, λh equation, NRTL model, GSM model and the modified Jouyban–Acree model. The dissolution mechanism of malonic acid in (2-propanol + ethyl acetate) solvent mixtures was interpreted theoretically. The inverse Kirkwood–Buff integrals method was applied and it was found that the value of δx1,3 is negative in high ethyl acetate fractions, but becomes positive at 2-propanol mole fractions greater than 0.60 at 298.15 K. In addition, molecular dynamic simulations were carried out to characterize the intermolecular interactions using the radial distribution function. The online version of this article ( https://doi.org/10.1007/s10953-019-00853-7) contains supplementary material, which is available to authorized users. This work was financially supported by the National Natural Science Foundation of China (21706284), Shandong Scientific Foundation Project (Grant Number ZR2017BB085), Qingdao Postdoctoral Project (Grant Number 2016223) and National Science and Technology Major Project (2016ZX05053-008).